Welcome to I Don’t Need No Stinkin’ Film School, my weekly article to prove that I have it in me to go from movie buff to film critic. Each week I cover movies I’ve heard feature prominently in film school, films I believe are worth exploring deeply, classics I’m ashamed to have never seen, and occasional new releases if they strike me as classics-in-the-making. As these are longish discussions, spoilers follow. For more from me, check out the rest of Defeating Boredom or follow me on Twitter, @Rob_Samuelson. Criticism is a great thing. By thinking deeply about art, we can arrive at an understanding of where humanity stands at the time the art was produced. When criticism is utilized by the art itself, we can be treated to works of entertainment that speak to both society in general and the currently accepted concept of art. Filmmaker Quentin Tarantino (Pulp Fiction, Inglourious Basterds) and television auteur Dan Harmon (Community) are perhaps the most famous examples of the critic-as-artist phenomenon. But they are not the first. 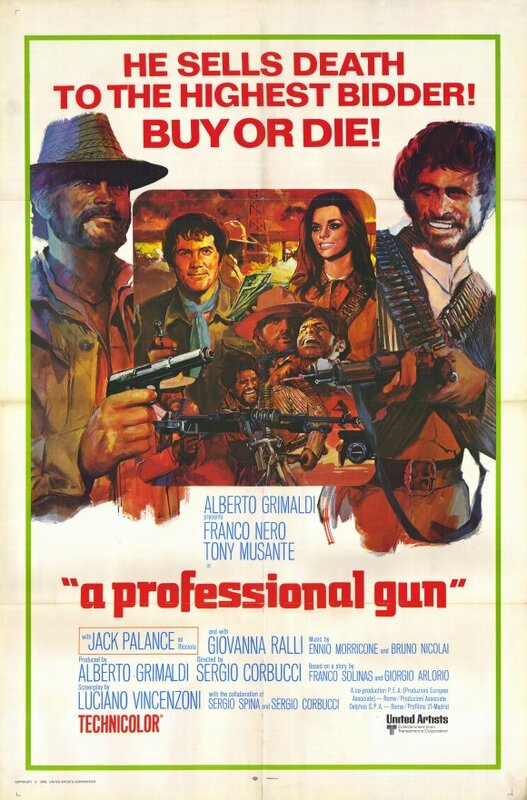 Italian director Sergio Corbucci led the way for the Tarantinos and Harmons of the world by injecting postmodern conceits and film commentary into his movies, like the spaghetti westerns Django and the film I watched the other day, 1968’s The Mercenary (or A Professional Gun depending on where you saw it). He may not have been wholly successful, but his contributions to this filmic sub-genre are nonetheless important. I think I need to own this poster. The Mercenary‘s opening credits set the B-movie tone nicely, with blood red title cards introducing animated versions of the cast members, propped up by the obligatory Ennio Morricone score. Per usual, Morricone displays an innate ability to create sounds that define western frontier life. As the credits fade, the saturated Technicolor hues of a bullfighting pit enters our view. So, too, do little people dressed as clowns, mugging for the crowd. Another, larger clown enters and wrangles a “bull” (two people wearing a bull costume like grade schoolers in a play) while the crowd laughs. Sitting in the stands is Corbucci’s frequent lead actor of choice, Franco Nero, projecting anti-hero bravado as he swipes a match across a stranger’s hat without caring what the man thinks. Like most spaghetti and revisionist westerns, The Mercenary makes no effort to live up to conventional Hollywood Old West tropes; instead, Corbucci acknowledges those tropes for the manufactured falsities they are, and pokes fun at them. The plot serves as a vehicle for what Corbucci wants to say about the western genre, filmmaking in general, and, I contend, his own insecurities as a director. The film centers on Nero’s character, Sergei Kowalski (the world’s most Italian man playing the world’s least convincing Polish man), the mercenary of the film’s title, joining forces with Tony Musante’s Paco Roman, a Mexican revolutionary with the intention of overthrowing the Mexican government. Kowalski won’t help without being paid, and the power struggle between the two men dominates much of the film’s runtime. To complicate matters, Jack Palance’s villainous Curly hunts the two men for vague reasons — probably money — and Mexican Colonel Alfonso Garcia wants the revolutionaries dead to preserve the Mexican union. If this plot sounds familiar, that is because it’s clearly a huge influence on 1971’s Duck, You Sucker, directed by the more famous Sergio of Italian spaghetti western films, Sergio Leone. Despite Corbucci getting the jump on Leone for this particular plot, Leone’s (The Good, The Bad, and The Ugly, Once Upon a Time in the West) presence hangs heavy over The Mercenary. Every tool in Leone’s stylistic repertoire is yanked by Corbucci for this movie. The extreme closeups, the power zooms, the aforementioned Morricone score, the even-if-it’s-in-English line overdubbing, the stark rural-Spain-as-Old-West landscapes, everything is there. Except under Corbucci, it doesn’t feel fresh or interesting. Even if Corbucci is trying to make a statement about Leone’s success, he does not do it in a way that acknowledges his intent to make a statement. This is an instance when a wink and a nudge to the audience would do Corbucci well; instead we get warmed over aping of a better director’s techniques. Of course, I could be projecting here, but I think this says a lot about Corbucci’s faith in himself as a singular director. He may not be confident in the film’s story or his ability to tell that story successfully, so he needs to make it fancier in order for it to compare to his influences. Studio pressure probably played a role, too. It’s hard to argue with trying to make your movie more like one of cinema’s finest directors. But doing that removes any possibility of Corbucci fully putting his stamp on the work. Instead of The Mercenary definitively being “a Sergio Corbucci film,” it requires a “… with an assist from Sergio Leone” caveat. While he does not achieve what he wants by critiquing specific films like Leone’s, Corbucci succeeds in The Mercenary by skewering western filmmaking as a whole. His lead female character, Columba (Giovanna Ralli), does not play the “submissive female” role prevalent in Hollywood at the time (and, let’s face it, to this day). She is strong, confident, idealistic, and ultimately loyal to both her cause and Paco, the man she deems worthy of her. Columba is the only truly righteous and capable character in the film; it should come as no surprise she is the one with enough skills and savvy to save the day in the end. Another interesting note about The Mercenary from a critical standpoint is its setting. As it is clearly a western, one would expect the time period to be in those short years following the American Civil War during the country’s Western Expansion phase. But Corbucci does not go that route. He toys with audience perception by setting the entire movie in Mexico during the time before their revolution, far from John Wayne’s stomping grounds. This accounts for the film’s distinct European flavor: social justice is important, whereas greed goes punished (see the American Curly and, to a lesser extent, Kowalski). Seeing an early airplane in a western also helps throw off the audience in a good way. Corbucci’s direction shines brightest in the gunfight sequence between Paco and Curly, once Curly finally catches him. Back where the film started, Paco is revealed to be the taller clown, hiding out after his initial revolution attempts fail. Curly arrives after Paco’s show, with the former still in his garish clown makeup. Accepting Curly’s challenge, a darkly comic face-off takes place. Corbucci had heard the criticisms of Django; many bristled at its violence. This gunfight in The Mercenary was him hitting right back, showing just how silly it is to worry about violence in films. By positioning the goofy clown against the slick, attractive villain, Corbucci shows how everything is a theatrical lark, and he relishes in the “just having fun” aspect of making a film. In doing so, he achieves The Mercenary‘s only scene that matches the tension and pure craftsmanship of the superior Leone epics. Sergio Corbucci understood the importance of film criticism. His pictures, like The Mercenary, paved the way for the postmodern filmmaking we enjoy today. Perhaps he struggled with his self confidence when placed next to cinematic giants like Leone, which may have affected his ability to create a truly great film. Therein lies the problem with filmmakers like Corbucci: Sometimes their critical minds get in the way of telling a thrilling, original tale. Luckily, though, Corbucci’s influence has provided us with people like Tarantino, who never sacrifices entertainment or storytelling for academia or “see what I did there?” tricks. Hopefully Tarantino’s upcoming Corbucci-and-Leone love letter, Django Unchained, will continue on that path without falling into the traps Corbucci’s spaghetti westerns did.